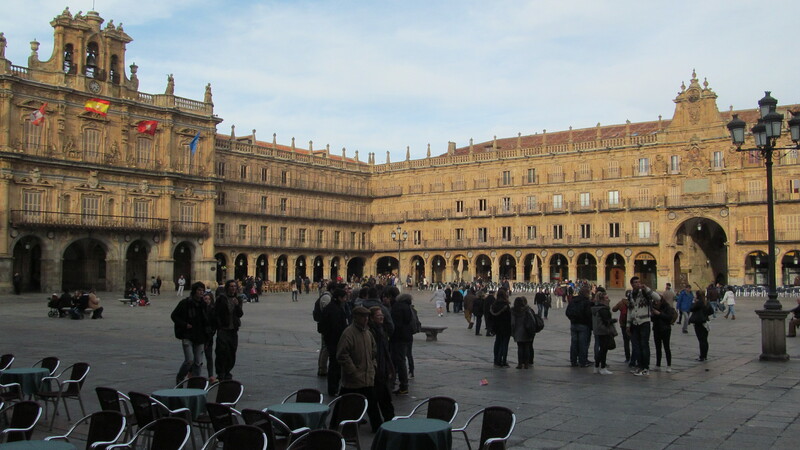 I have finally made it to Salamanca, an ancient university city, founded in the 12th century, of similar vintage as Oxford, Coimbra in Portugal and Bologna in Italy, located in the northern mesata, tablelands, with prairie-like fields of grain extending to beyond the horizons in all directions. It is built primarily of a golden sandstone, very reminiscent of Oxford and of Cotswold villages. 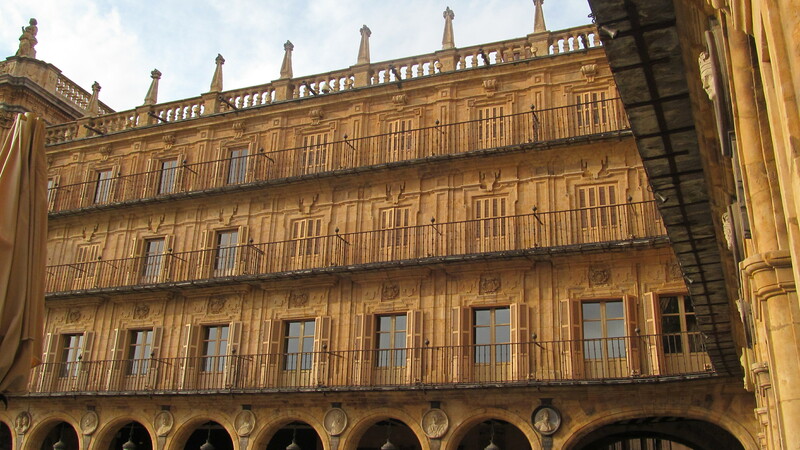 And, of course, it has its own Plaza Mayor, the impressive section on the left with balconies for the royal family when in attendance at events in the square. I had the opportunity to enjoy a beer in the outdoor café across the way as the sun was setting and was able capture some of the sandstone’s marvellous glow at this time of the day. 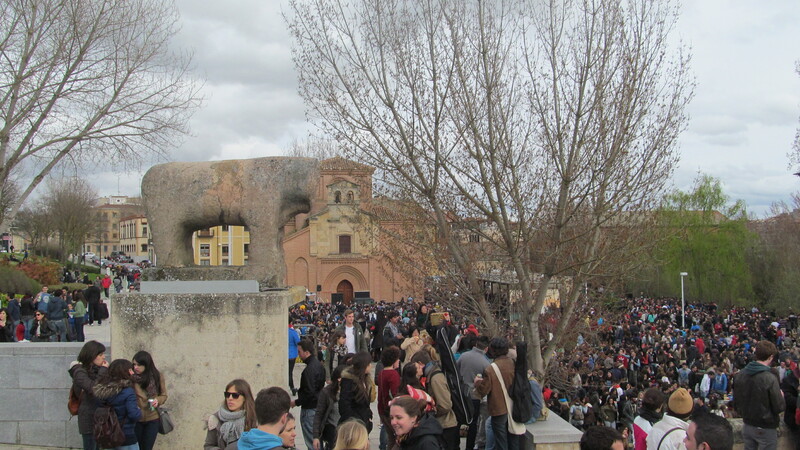 If you go back to the first photo, you will notice of course that there are many people in the square; it is a university town and the streets and squares are absolutely filled with 20 somethings. I think that the city has to hire old folks to stroll about to maintain some sense of balance. On top of it all, on this day , just beyond the old walls in the open air, a rock concert was taking place with an estimated 6 thousand youngsters enjoying the live band and inevitably littering the parkland. And the whole scene dramatized in a curious way the conjunction of past, present and future in this city. I am actually standing on a Roman bridge which crosses the river to the right, 26 some arches, at least 16 were part of the original span built in the first century of this era. The church of Santiago in the middle distance is 12th century Romanesque. The curious stone animal is a Varraco that dates from the megalithic period (Stonehenge and other such circles as well as dolmens, burial sites that are found across Europe from around 5000 years ago). They are found in Spain and their function might have been to assert territorial control or for religious, ceremonial reasons. And wonderfully loud raucous rock music to bring all these ages together, of course, in the presence of kids between the ages of 16 and 24 and this one old fart. And the cathedrals (Salamanca has two) presiding over the afternoon. I chose this photo from the bridge to show how it is still used in this pedestrian-intensive city; the concert is behind those trees at its far end. Excuse the cloudy skies. The cathedrals and university buildings are primarily from the 15th and 16th centuries, the Renascentista Style – popularized in Italy and elsewhere. I do not like this style of architecture. I prefer Romanesque, 11th and 12th century, rounded arches, with relatively simple sculptural additions. The cathedral is overdone and quite simply makes me uncomfortable to be around and in. It is simply my preference, my taste, developed to a degree from the time I have spent in the back valleys of Spain searching out small rural parish churches. I have done this often enough that the simple stone work now gives me a buzz. Now if I had been alive when this cathedral was being built, would I have been bothered, even been angry at this new fang dangled style. 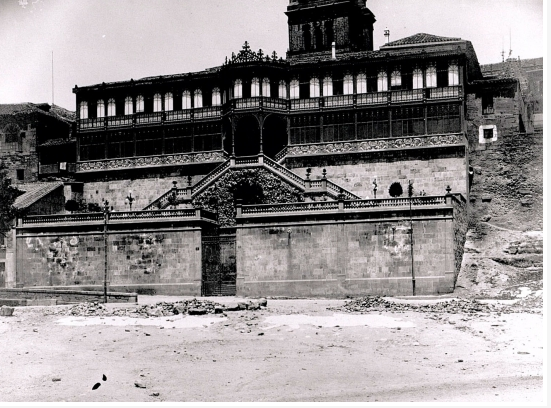 Romanesque buildings were possibly and probably torn down to build it. Would anybody else in the town have been upset by this careless neglect of the old and preference for the new? Did anyone care about what was happening to their neighbourhood? I have found the keys at times to Romanesque village churches in order to see the interiors only to be disappointed, even angry because of the renovations, modifications, “updatings” – “oh, let’s change this old way for the new way” – so many have Baroque altars, everything painted in gold. I first impulse is to lock up and return the key as quickly as possible, muttering “ba-roken, ba-roken” under my breath. I have spent time in Oxford, with its many colleges, each built in a different part of a different century, in somewhat different and evolving styles. We do not notice unless we are art historians. A noted Victorian scholar was so incensed by the “new” look of a recently built college that he purposely changed the route of his daily walk so as not to have to see what he thought was an abomination. 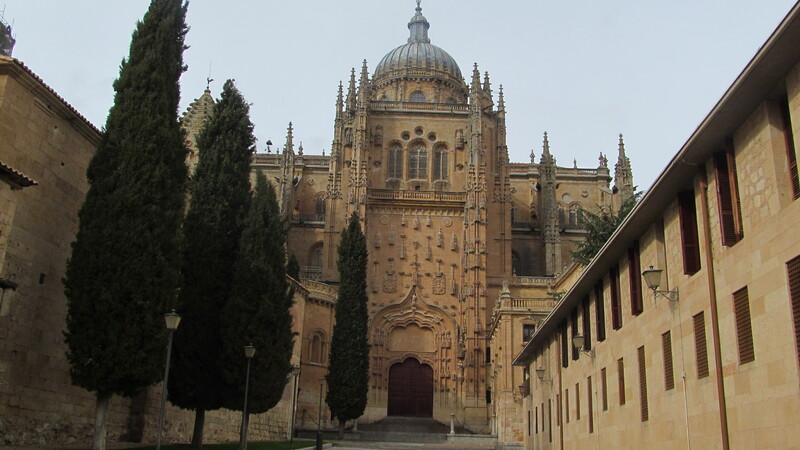 Would anybody in 16th century Salamanca have thought of this cathedral as an abomination? Were the residents of this ancient city through the centuries concerned about the urban landscape or is this just a 20th and now 21st century concern? 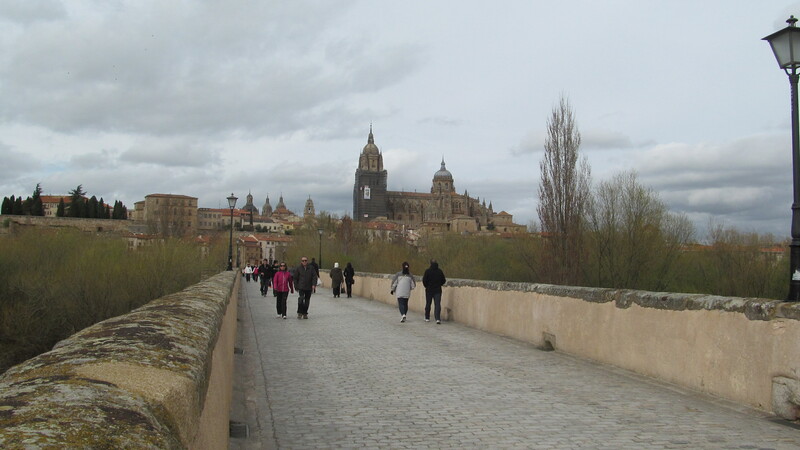 A wealthy factory owner in Salamanca at the turn of the 20th century would clearly have challenged many a resident with the design of his mansion, built on the walls of the old city, looking down over the park (and the Roman bridge, 12th century church and 5000 year old Varraco). This is what this jewel looks like today, virtually identical. 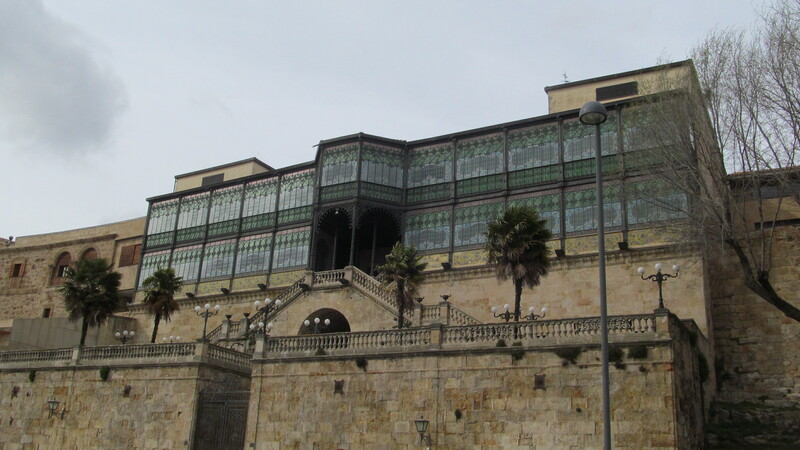 Today within the parameters of this ancient city, with its ancient university buildings and innumerable, it seems, churches, this building contains an amazing museum of Art Deco and Art Nouveau. What a surprise? 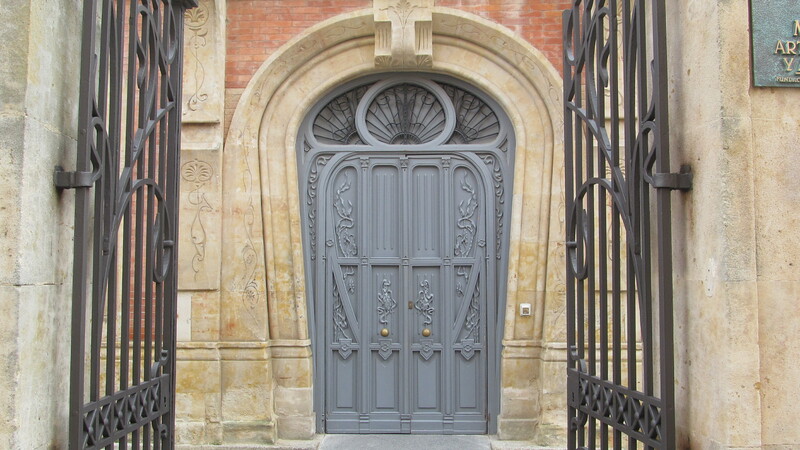 The original door, gate and carvings in the stonework around the door. The jewel is the central atrium. I was not allowed to take photos; what you see now is therefore illegal. A true devotee of these styles could spend all day here; I learned a lot, the collection is very comprehensive, worth the trip to Salamanca. 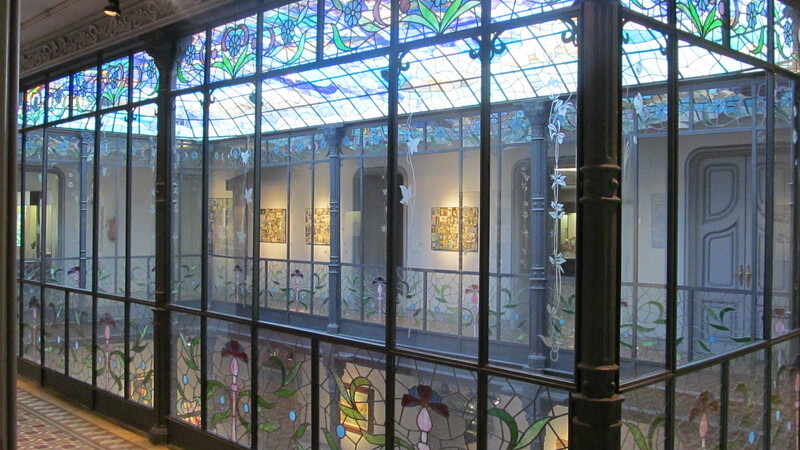 I have to add one more sight and insight into Salamanca, past, present and future. The Spanish eat a lot of jamón, have for centuries, and will continue to eat this national dish, many of them, I am sure, at every meal. 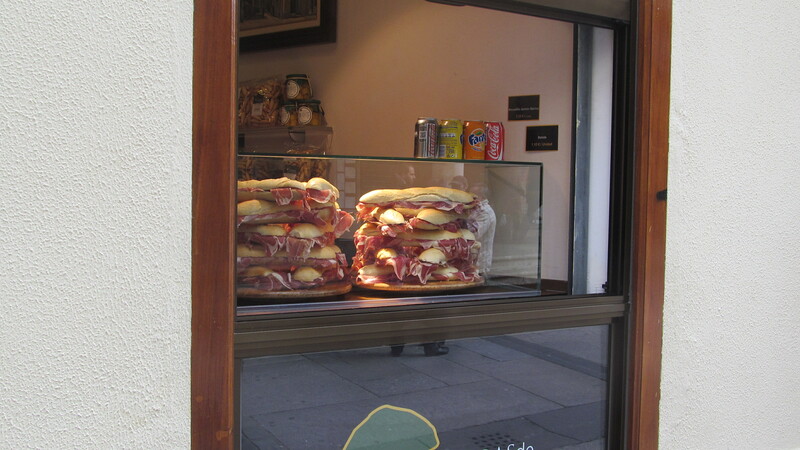 These sandwiches literally dripping with slices of jamón ibérico possibly say it all. This entry was posted in medieval architecture, Salamanca, Spain, travel in Spain, Uncategorized and tagged clash of architecture, medieval architecture, Salamanca on April 11, 2013 by agnotarte.